The other night we had to work a touch later than usual, so my mantra for dinner was "keep it simple." There would be no reinventing the wheel, just fill our belly's with something relatively healthy that wouldn't take too much effort to put together. Turns out this was the perfect solution. Earthy and sweet and just enough for two to eat in bowls by the fire. Not a bad way to end a long day. In a large bowl toss together the diced beets with the olive oil, dried thyme and a pinch of salt and pepper. 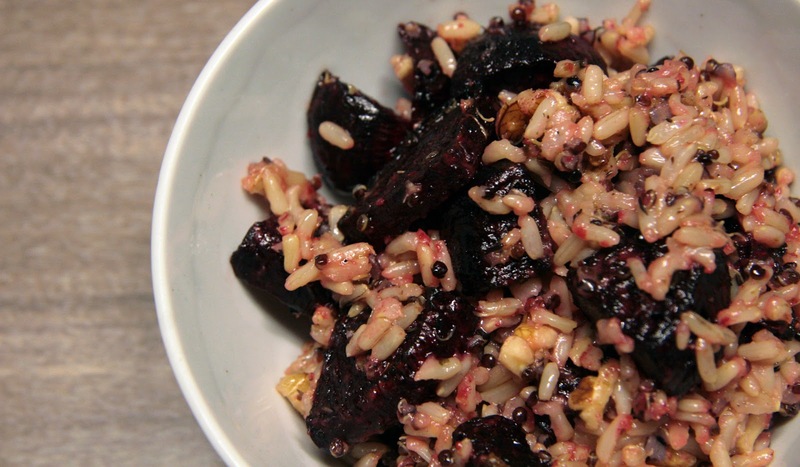 Spread out the seasoned beets on a rimmed baking sheet. Roast in oven for 30-35 minutes. 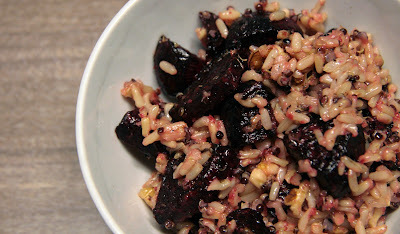 When the beets are fork tender, add them back into the large bowl along with the cooked quinoa, add in the toasted walnuts and pour in the orange juice. Serve warm (or room temp). *Note: I actually used a combination of long grain brown rice and quinoa seasoned with a touch of garlic powder. Here's to dinners that work out surprisingly well during a busy work week!